3 phases in 1 gel! Low viscosity ensures self-leveling of the material and ease of use. Ultimate gel for all types of the nail building and for the natural nails strengthening! It has excellent properties of adhesion to the nail plate, is used as a thin base layer, a pad of the free edge of the nail, a building layer and a top coat in any nail modeling technique. Easy to use – perfect self-leveling! The standard use of mono-gel – apply a very thin layer on the prepared nail, as the first phase – adhesion. Polymerization in a lamp. Apply a thin layer on the nail after Gel Polish, Sculpting Gel or Décor Gel application, fixation in a UV / LED lamp. Coat the design with an additional layer, if needed. The second layer is a nail extension or modeling with a denser layer. 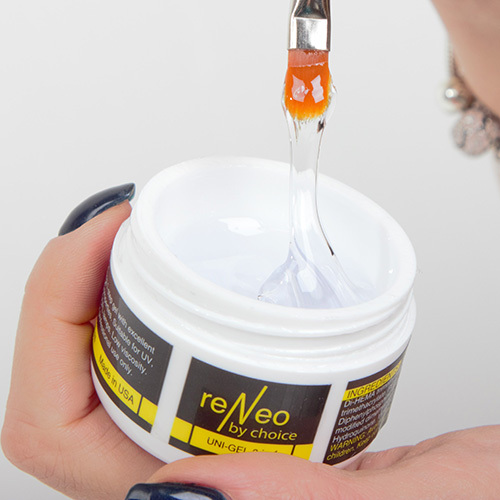 As the gel has a low viscosity, it is recommended to work with nails one-by-one, fixing each nail in a lamp for 15-20 seconds. Finish with polymerization of all fingers together. Remove a dispersion layer. If necessary, file off and make a design. Apply the third thin layer of Top Coat. Polymerization in a lamp. In case of a quick correction, you can use the second layer only, combining the building and finish in one phase. Gel has a wonderful gloss!